Aldean was born in Macon, Georgia. His parents separated when he was three. He was raised by his mother in Macon, and during the summer he would spend time with his father in Homestead, Florida. Before his father went to his work he would map out guitar chords on notebook paper to show Jason where to place his fingers to play the chords, and the boy would sit and practice all day while his dad was at work. When his dad got home, he got out his own guitar and they played together. Soon he could play a song after hearing it only a few times. His early favorites included George Strait's "The Cowboy Rides Away", Hank Williams Jr.'s "The Blues Man", and Alabama's "My Home's in Alabama". Both of his parents encouraged young Aldean as he progressed musically. From age 14, after watching the country-music awards on television, he wanted to perform on stage. With his mother's help, he performed at the local VFW hall in Macon. He sang John Anderson's song "Seminole Wind" and Tracy Lawrence's "Sticks and Stones". He then began performing at area talent contests and local fairs. At 15, he joined the "house band" at Georgia nightspot Nashville S.
In order to stand out, Aldean changed the spelling of his middle name, Aldine, to come up with the name Aldean." After high school, with his father's help, Aldean and his band performed at clubs and festivals around the Southeast. With Justin Weaver (one of the band's members), Aldean began writing and recording original songs. In 1998, he performed songs from his first album at a showcase staged by Atlanta nightclub The Buckboard. He was approached by Michael Knox, then of the Warner-Chappell song-publishing company. After signing with Warner-Chappell, Aldean moved to Nashville on November 1, 1998, at age 21. Aldean was offered a recording contract but was subsequently dropped. He signed with another label but again was dropped in 2000 after his label postponed his recording sessions repeatedly. Various showcases failed to bring him a contract. The last straw was an attempt at the Wildhorse Saloon where the promised label talent scouts never even showed up. Still frustrated and discouraged with his struggling career, Aldean gave himself six months before planning to leave Nashville and return home to Georgia. Then five weeks later, he was offered a deal from Broken Bow Records in Nashville. Shortly after the release of his self-titled debut album, Aldean picked up his new (and current) agent Kevin Neal. Furthermore, while recording Relentless, Aldean moved to Clarence Spalding and Spalding Entertainment for management. Aldean's debut single, "Hicktown", was released in early 2005. It served as the lead-off to his self-titled debut album and reached number 10 on the US Billboard Hot Country Songs chart. The album also produced his first number one hit with "Why". This album finally released the number 4 hit "Amarillo Sky", which had previously been a non-charting single in 2002 for McBride & the Ride. This song earned a 2006 ACM nomination for Song of the Year and Video of the Year. Aldean earned the title "Top New Male Vocalist" at the 2006 ACM Awards. The album has sold over 1,000,000 copies in the United States and was certified platinum by the RIAA in 2007. Aldean spent most of January 2007, in the studio with producer Michael Knox to finish his second album, Relentless. This album was released on May 29, 2007 and at Wal-Mart locations, it was released with a Limited Edition CMT Pick DVD that included Aldean's performances. The album's lead-off single, "Johnny Cash", was originally recorded by Tracy Byrd, but Aldean's version of it peaked at No. 6. Its followup "Laughed Until We Cried" became his 5th consecutive Top 10 hit. Relentless has also been certified platinum by the RIAA, and its title track was released as its 3rd single. The song has also been Aldean's lowest-charting single both in the U.S. and Canada, failing to reach the Top 10 on the country charts. 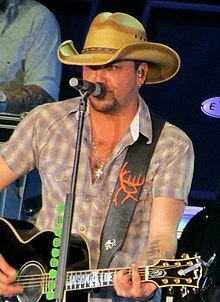 Aldean released his seventh single titled "She's Country" on December 1, 2008. This song serves as the lead-off single from his third album Wide Open, which was released on April 7, 2009. The single debuted at No. 51 on the Hot Country Songs chart in late-November 2008. Being his 7th consecutive Top 40 hit on the country charts, it is also his 1st Top 40 hit on the Billboard Hot 100. It later became his second number-one hit, and his first since "Why" in May 2006. The next single, "Big Green Tractor," became Aldean's third number-one hit. Wide Open debuted at No. 2 on the Top Country Albums chart. "The Truth" became the album's third consecutive number-one hit in January 2010, with "Crazy Town" being the album's fourth single and peaking at No. 2 on the country charts. 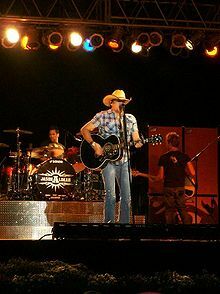 Aldean performed with Bryan Adams on an episode of CMT Crossroads in the beginning of May, and the episode premiered on June 26, 2009. In an interview with Shave Magazine, Aldean explained that working with Bryan on Crossroads "was great" and that "[h]e was a lot of fun." But the real highlight for him was that he was working with Randy Owen. "I am a big fan of Alabama so I got a chance to work with Randy Owen on this album (it didn't make the album but it eventually made a bonus track). It was really cool. Alabama were like 'The Beatles' for me so working with him was definitely one of the highlights," he said "I mean, both of those guys were really cool moments, but if I had to pick one highlight, it would be working with Randy [Owen] this year." A live DVD titled Wide Open Live & More was released on August 25, 2009. At the 2010 CMT Music Awards, Aldean picked up 3 nominations in Video of the Year and Male Video of the Year for "The Truth", as well as Collaborative Video of the Year and CMT Performance of the Year for his performance of "Heaven" with Bryan Adams. In August 2010, Aldean released a new single "My Kinda Party", which entered the Hot Country Songs chart at No. 41. It is the lead-off single from his album of the same name, which was released on November 2, 2010. It marks as Aldean's tenth top-10 country hit. Aldean also collaborated with Kelly Clarkson on the intimate duet "Don't You Wanna Stay". His and Clarkson's performance on November 10, 2010, at the CMA Awards received positive recognition, and debuted at No. 59 on Billboard's Hot Country Songs chart from unsolicited airplay for the week of November 20, 2010. In March 2011, it became Aldean's fifth number-one hit. In early 2011, Aldean's version of "Dirt Road Anthem", which was recorded previously by both of its writers country rap artist Colt Ford and Brantley Gilbert (who also wrote "My Kinda Party"), debuted on the Hot Country Songs chart at No. 57 as an album cut  from an unsolicited airplay for the week of February 5, 2011. In March 2011, the song was chosen as the third single from My Kinda Party. Aldean also collaborated with Ludacris for the song at the 2011 CMT Music Awards in Nashville, Tennessee on June 8, 2011. In addition to making #1 on the Hot Country Songs chart for the week of July 30, 2011, it also became Aldean's first Top 10 hit on the Hot 100 chart. Aldean performed "My Kinda Party" at the start of the 2011 Home Run Derby, which was broadcast on ESPN. Aldean won the CMA award for Album of the Year in 2011 as well as the Musical Event of the Year with "Don't You Wanna Stay", his duet with Kelly Clarkson. This was his first win. On October 25, 2011, it was announced that Aldean would be performing on The Grammy Nominations Concert Live! – Countdown to Music's Biggest Night, the 1-hour special which took place live on Wednesday, November 30, 2011, at the Nokia Theatre in Los Angeles. "Don't You Wanna Stay" received a Grammy nomination for Best Country Duo/Group Performance, but however lost to The Civil Wars at the 54th Grammy Awards on February 12, 2012. The fourth single from the album was "Tattoos on This Town", which peaked at No. 2, followed by yet another number one single, entitled "Fly Over States". The 1st single from Aldean's 5th album was entitled "Take a Little Ride." It was released on July 16, 2012. Later, the album's title was announced as Night Train. This album was released on October 16, 2012. Its second single, "The Only Way I Know," is a collaboration among him, Luke Bryan, and Eric Church. The album's third single, entitled "1994," is a tribute to Joe Diffie. The album's fourth single, the title track, was released to country radio on June 24, 2013. The fifth single, "When She Says Baby", was released to country radio on November 18 of that same year. "Take a Little Ride", "The Only Way I Know", "Night Train", and "When She Says Baby" all peaked at number 1 on the Country Airplay chart respectively. During a radio interview on May 18, Aldean hinted at another possible collaboration with Ludacris. He did state that it would not be on Night Train. On December 16, 2014, Ludacris released an Extended Play titled Burning Bridges, in which the title track featured him and Aldean as a duet. Aldean performed "My Kinda Party" during the People's Choice Awards on January 9, 2013. On June 5, 2013, Jason Aldean co-hosted the 2013 CMT Music Awards with actress Kristen Bell. He and Lenny Kravitz opened the awards show singing "American Woman". On July 22, 2014, Aldean released a new single "Burnin' It Down". This song would serve as the lead single off his sixth studio album Old Boots, New Dirt, which was released on October 7, 2014. This song reached #1 both on the Hot Country Songs and Country Airplay charts. The album's second single, "Just Gettin' Started", was released to country radio on November 10, 2014. It reached #1 on the Country Airplay chart in March 2015. "Tonight Looks Good on You" was released as the third single on March 23, 2015. It reached #1 on the Country Airplay chart in July 2015. also performed CMT Crossroads with Bob Seger song called "Turn the Page". The album's fourth single, "Gonna Know We Were Here" released to country radio on August 17, 2015. It reached #2 on the Country Airplay chart in January 2016. Jason Aldean is one of only three artists to achieve RIAA platinum sales certification on an album released this year. His Old Boots, New Dirt album, which debuted at the top of Billboard's all-genre Top 200 chart in October, has now shipped more than one million units. This means that he is the only country star to release a platinum-seller in 2014, and joins only Taylor Swift and Ariana Grande in platinum album certifications for collections released this year. At the conclusion of Aldean's Burn it Down Tour, Aldean donated over $600,000 to Susan G. Komen of South Florida. In July 2016 it was announced that the seventh regular studio album, They Don't Know, was set for release on September 9 of that year. Again produced by Michael Know, the album was preceded by the single "Lights Come On", released to country radio on April 1, 2016. The album's second single, "A Little More Summertime", released to country radio on July 15, 2016. The album's third single, "Any Ol' Barstool", was released to country radio on December 5, 2016. The album's fourth and final single, the title track of the album, was released to country radio on May 8, 2017. At the 2016 ACM Awards, Aldean was awarded Entertainer of the Year for the first time in his career. He would go on to win that award in 2017 and also 2018. In March 2017, Aldean announced that he is working on his eighth album, titled Rearview Town, which is set to be released on April 13, 2018. The lead single, "You Make It Easy", was released on January 26, 2018. Aldean has also confirmed two other songs set to appear on the album, "Gettin' Warmed Up" and "Set It Off". On October 1, 2017, Aldean had just begun performing "When She Says Baby" at the Route 91 Harvest festival on the Las Vegas Strip in Paradise, Nevada when Stephen Paddock began firing into the crowd from the 32nd floor of the Mandalay Bay Resort. Aldean and his band managed to exit the stage unharmed, but 58 people were killed and 851 people were injured as a result of the incident. On October 7, 2017, Aldean opened Saturday Night Live with words of support for those hurting in the aftermath of the shooting. He then performed a cover of "I Won't Back Down" by Tom Petty, who had died the day after the shooting. Jason has been an avid supporter of raising awareness for breast cancer research since 2004, after losing a dear friend to the disease. He has raised close to $4M for cancer research through donating a portion of each ticket sale, special merchandise, VIP meet & greets, a donate button on his website, and his annual Concert for the Cure, most of which he has contributed to Susan G. Komen for the Cure. Aldean married Jessica Ann Ussery on August 4, 2001. Together, the couple have two daughters: Keeley born February 2003, and Kendyl born August 2007. On September 30, 2012, Aldean admitted to having "acted inappropriately at a bar" with former American Idol contestant, Brittany Kerr, responding to reports linking her and Aldean. In a statement, Kerr said she had suffered "a lapse in judgment" and "would like to sincerely apologize to everyone that has been affected by this." Aldean filed for divorce on April 26, 2013, citing irreconcilable differences and listing the filing date as the formal separation date. Aldean and Kerr began dating and made their first public appearance as a couple at the 2014 CMT Awards. On September 24, 2014, Aldean and Kerr announced their engagement. The couple was married on March 21, 2015. On May 8, 2017, Aldean and Kerr announced that they were expecting a baby. Their son Memphis Aldean was born in December 2017. On July 10, 2018, Aldean and Kerr announced that they were expecting their second child together. Their daughter Navy Rome was born February 4, 2019. Aldean owns a hunting company called Buck Commander, in partnership with former Major League Baseball (MLB) players Adam LaRoche, Ryan Langerhans, and Tombo Martin; Willie Robertson of Duck Dynasty; and fellow country singer Luke Bryan. Aldean is a Georgia Bulldogs fan and spends Saturdays in the fall watching every game. He played the first-ever concert at the University of Georgia's Sanford Stadium for over 60,000 fans in April 2013, including an appearance by Ludacris for their collaboration of "Dirt Road Anthem." In 2015, Forbes estimated Aldean's annual income at $43.5 million. Aldean's road band consists of Rich Redmond, Tully Kennedy, and Kurt Allison which were all formerly part of the band Rushlow, fronted by former Little Texas lead vocalist Tim Rushlow. The road band, along with David Fanning, also comprises the production team New Voice Entertainment. Fanning is also signed to Broken Bow's sister label, Red Bow. ^ "Jason Aldean & Sam Hunt Chart New Path With R&B-Influenced Country". Billboard. October 7, 2014. Retrieved November 2, 2015. ^ a b Whitburn, Joel (2008). Hot Country Songs 1944 to 2008. Record Research, Inc. p. 21. ISBN 0-89820-177-2. ^ a b c d "Jason Williams vs. Jessica Ann Ussery Williams Complaint for Divorce" (PDF). Chancery Court for Williamson County, Tennessee. April 26, 2013. Archived (PDF) from the original on January 12, 2016. Retrieved April 29, 2013. ^ a b c d e Leggett, Steve. "Jason Aldean Biography". Allmusic. Retrieved December 23, 2010. ^ "10 Country Stars That Use Stage Names". January 20, 2015. ^ a b c d e f g h i j k l m n o p q r s t u v w "Jason Aldean Album & Song Chart History – Country Songs". Billboard. Prometheus Global Media. Retrieved August 11, 2011. ^ "Artist". MusicRow. January 28, 2011. Retrieved February 3, 2011. ^ Ziyah. "Interview With Jason Aldean". ShaveMagazine.com. Retrieved November 30, 2009. ^ "Jason Aldean, Lady Antebellum, Sugarland Lead 2010 CMT Music Awards Nominees | CMT Blog". Blog.cmt.com. April 5, 2010. Retrieved February 3, 2011. ^ "Jason Aldean Sets Release of Fourth Studio Album – My Kinda Party for 11.2.2010". Jason Aldean. August 23, 2010. Retrieved August 23, 2010. ^ "CMT: News: Kenny Chesney's "Somewhere With You" Remains on Top". CMT. January 29, 2011. Retrieved February 5, 2011. ^ "Aldean, Others Set To Perform For Grammys Nomination Party!". WUSN-FM US99.5. ^ "Jason Aldean Album & Song Chart History – Country Airplay". Billboard. Prometheus Global Media. Retrieved November 8, 2012. ^ "Jason Aldean to Collaborate with Ludacris Again". Broadwayselectricbarnyard.com. Archived from the original on October 7, 2014. Retrieved October 6, 2014. ^ "Jason Aldean, Lenny Kravitz Open CMT Music Awards With "American Woman"". Cmt.com. Retrieved October 6, 2014. ^ a b "Jason Aldean Scores Only Platinum-Certified Country Album of 2014". Retrieved October 5, 2015. ^ McClellan, Laura. "Jason Aldean Wraps Tour, Donates $600K to Breast Cancer Research". Taste of Country. Retrieved November 5, 2015. ^ Betts, Stephen L. (July 11, 2016). "Jason Aldean Unveils New Album 'They Don't Know'". Rolling Stone. Retrieved July 14, 2016. ^ "Jason Aldean Is in the Studio, Working on Eighth Album". Taste of Country. Retrieved April 16, 2018. ^ a b c "Jason Aldean Drops New Single 'You Make It Easy' [Listen]". Taste of Country. January 26, 2018. Retrieved January 26, 2018. ^ Dukes, Billy (January 27, 2018). "Jason Aldean's Dropping 'Rearview Town' Secrets All Around Town". Taste of Country. Retrieved March 23, 2018. ^ Sanders, Emmeline (October 2, 2017). "Terrifying moment country music star Jason Aldean's Las Vegas performance is cut short by gunfire'". Rolling Stone. Retrieved October 2, 2017. ^ "#MoreThanPinkHero: Jason Aldean passes the $4 million mark raising money for breast cancer". News Hill Nebraska. Retrieved December 7, 2018. ^ Aldean, Jason (September 30, 2012). "Hey Guys – I wanted to talk to you directly ..." Jason Aldean verified Facebook page. Archived from the original on May 9, 2017. Retrieved May 9, 2017. ^ Statement given to multiple outlets including "Brittany Kerr Apologizes for Jason Aldean Hookup -- 'Lapse in Judgment'". TMZ.com. October 2, 2012. Archived from the original on August 13, 2016. Retrieved May 9, 2017. ^ Errico, Sammi (June 5, 2014). "Jason Aldean Shows Off Former Mistress Brittany Kerr At CMTs". Hollywood Life. Retrieved June 24, 2014. ^ Nudd, Tim (September 26, 2014). "Brittany Kerr Flashes Engagement Ring from Jason Aldean: 'We've Been on Cloud Nine'". People. Retrieved November 18, 2014. ^ Corriston, Michele (March 21, 2015). "Jason Aldean Marries Brittany Kerr". People. Retrieved May 9, 2017. ^ Juneau, Jen (May 8, 2017). "Baby on the Way for Jason and Brittany Kerr Aldean — See Their Adorable Announcement!". People. Retrieved May 9, 2017. ^ Iasimone, Ashley (December 2, 2017). "Jason Aldean and Wife Welcome Baby Boy". Billboard. ^ Leon, Anya (July 10, 2018). "Jason and Brittany Kerr Aldean Expecting Second Child". People.com. Retrieved July 10, 2018. ^ "Brittany Aldean Instagram". Retrieved February 17, 2019. ^ "Buckmen". Buck Commander. November 21, 2009. Retrieved June 24, 2013. ^ "Jason Aldean". Forbes. 2015. Retrieved April 28, 2016. ^ "Jason Aldean Announces Massive They Don't Know Tour". Sounds Like Nashville. January 13, 2017. Retrieved April 5, 2017. ^ "Jason Aldean's Band Tells the Story of Production Team New Voice Entertainment". Tasteofcountry.com. November 7, 2011. Retrieved June 24, 2013. ^ "News : Headlines : 42nd Academy of Country Music Awards Final Nominees : Great American Country". Gactv.com. May 15, 2007. Archived from the original on January 24, 2013. Retrieved October 16, 2012. ^ "2007 CMA Awards Nominations · Country Music News · ACountry · Just Like Being There". Acountry.com. Retrieved October 16, 2012. ^ "2010 CMT Awards Nominees". The Boot. May 11, 2010. Retrieved October 16, 2012. ^ "Jason Aldean Plays New Single 'Dirt Road Anthem' at 2011 ACM Awards". Taste of Country. Retrieved July 14, 2016. ^ "2011 Billboard Music Award Nominees Include Taylor Swift, Lady Antebellum". Tasteofcountry.com. April 13, 2011. Retrieved October 16, 2012. ^ "News : 2011 CMT Music Awards Nominees Revealed". CMT. April 27, 2011. Retrieved October 16, 2012. ^ "CMA Awards 2011: List of nominations – 11/09/2011 | Entertainment News from". OnTheRedCarpet.com. November 9, 2011. Retrieved October 16, 2012. ^ "Billboard Touring Conference and Awards". Web.archive.org. July 24, 2010. Retrieved April 16, 2018. ^ "Nominated for Two 2011 American Music Awards! » News". Jason Aldean. Retrieved October 16, 2012. ^ "American Country Awards 2011 Nominees Announced". Tasteofcountry.com. October 13, 2011. Retrieved October 16, 2012. ^ "54th Annual Grammy Awards Nominees And Winners". Grammy.com. Retrieved October 16, 2012. ^ "2012 ACM Awards Nominees Announced". Tasteofcountry.com. January 26, 2012. Retrieved October 16, 2012. ^ "Billboard – Music Charts, Music News, Artist Photo Gallery & Free Video". Billboard. Retrieved October 6, 2014. ^ "Jason Nominated for 3 CMA Awards!". Jason Aldean. Retrieved October 6, 2014. ^ "Cast Your Vote for the American Country Awards!". Jason Aldean. ^ "56th Annual Grammy Awards Nominees And Winners". Grammy.com. Retrieved October 16, 2014. ^ "Jason Nominated for ACM Award". Jason Aldean. Retrieved October 6, 2014. ^ "Here's The Complete List Of #iHeartAwards Winners | iHeartRadio Music Awards | iHeartRadio". iHeartRadio. Archived from the original on March 6, 2017. Retrieved March 12, 2017. ^ "Jason Aldean Earns Coveted Title of ACM Entertainer of the Year". Sounds Like Nashville. April 2, 2017. Retrieved April 5, 2017. ^ "CMT Music Awards 2017 Nominees Announced". Us Weekly. Retrieved May 10, 2017. ^ "Here Are All the Winners From the 2017 AMAs". Billboard. Retrieved November 24, 2017. ^ "53rd ACM Awards Winners". Retrieved April 16, 2018. ^ "CMT Music Awards 2018 Winners". CMT.com. Retrieved June 7, 2018. Wikimedia Commons has media related to Jason Aldean. "Jason Aldean Biography". Great American Country. Archived from the original on September 4, 2012. Retrieved March 30, 2008.